Harness the power of the sun and see how you can significantly reduce your energy bills. Green Star Solar offers complete solar installation in Newcastle, the Central Coast and Hunter Valley. Our solar panels harness the energy of the sun to power your home or commercial property. Whether your property has an off-grid, hybrid or grid-fed system, our solar panel installers will design a system for you that will help you save on the rising cost of electricity. Once your obligation-free solar installation consultation is booked, one of our installers will visit your site to discuss your requirements and design a solar PV system specifically to meet your needs. Once you have decided on a system and installation has been completed, it can normally be up and running within 4 to 5 weeks. 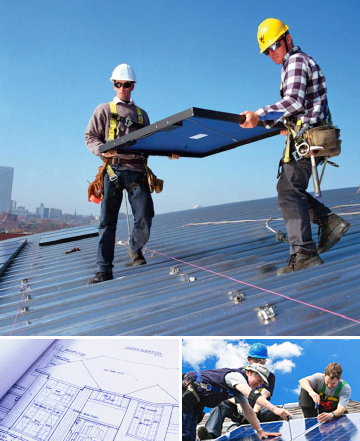 We’ll ensure that the panels are positioned correctly so that they can get as much direct sunlight as possible. Typically in Australia, panels are mounted facing north for maximum efficiency, as any shaded areas on panels can significantly reduce the amount of energy they produce. So, to reduce power loss in the connecting cables, we’ll also place the inverter as close to the panels as possible. We’ll also show you how to read the data panel on your inverter, which is where you’ll be able to read how much energy your panels are generating. An additional benefit of solar power is that it is an unobtrusive method of power generation. More often than not, panels are installed on the roofs of buildings or garages, meaning they’re generally out of sight. They also make no noise, so once we’ve installed them, you won’t even notice them. Green Star are fully accredited, professional solar panel installers servicing Newcastle NSW, the Central Coast and Hunter Valley. Our solar installers have many years of experience in the renewable energy sector, and are the experts at designing and installing the system that’s just right for your property. If you’re looking to reduce your energy bills and power your home with a natural energy source, call Green Star today on 1300 399 181 or email Gavin at info@greenstarsolar.com.au and we’ll give you a no-obligation installation quote.